Create Payments is a fully integrated and secure payment gateway ready to use with your ecommerce store - and it's free to join! Sign up through your Create account and begin processing payments right away. Have complete management over your checkout by using Create Payments, including the ability to view transaction volume, sales and total revenue generated through our tailor-made reporting system – all through your Create account. All major debit and credit cards are accepted and processing payments and orders could not be easier with exclusive control over transaction information and refunding, all in real time. Receiving and reconciling payments is just as easy with net settlements and bi-weekly batches paid directly into the bank account of your choice. You will also have access to the Worldpay Benefits Club which gives you exclusive discounts to a wide array of business and personal benefits. Select "Payment Gateways" from this drop-down menu. Once you have selected this, you will be taken to an application form to fill in. With bank account details, proof will be required in the form of a bank statement, in order to settle the funds to you. You can find out more about this below. If you operate as a sole trader, your must provide individual bank details for an account registered in your name only - joint and other multi-person accounts cannot be accepted for sole trading businesses. Please note: Before submitting your application you should ensure that your website complies with the Consumer Contracts Regulations in order to be accepted for Create Payments. If you're unsure about the regulations check out our guide "Website Content - What Must I Include" for tips. Complete the form and select the "Submit" button in the bottom right hand corner to send your application to join Create Payments. Once we receive your application, we will make the final checks before Worldpay take over the approval process and you will receive any updates via email. To learn more about the emails you may receive from Worldpay, please see our HelpCentre guide "Create Payments: Worldpay Emails". 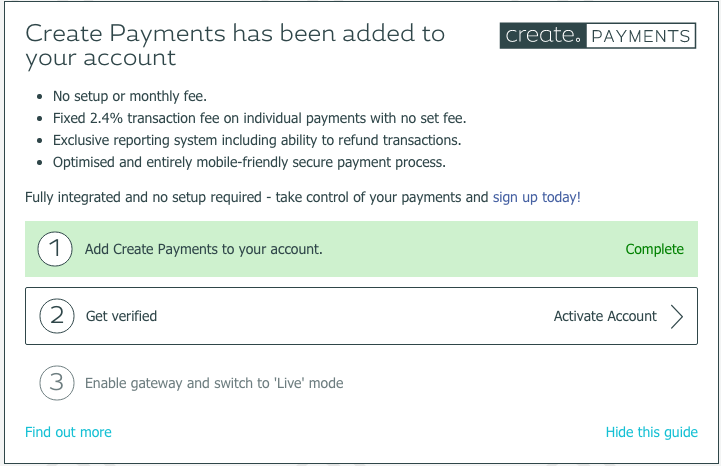 You are able to place a test order through your Create Payments gateway while waiting for your application to be accepted. This will enable you to see what the gateway will look like on your website, before it is activated! You can then use the following card numbers to test transactions in the test environment only. When using test cards, you can specify an expiry date up to seven years in the future. The test cards do not have a card verification code and issue number. For further information on placing a test order through your Create Payments gateway, please refer to the following help guide. Transactions are charged at a fixed 2.4% on individual payments with no set or monthly fee. There is no set up or joining fee with Create Payments, however you will be required to assert your PCI DSS compliance as required by law, and any service you choose to use to help you with this may incur cost. Worldpay offers a service, "SaferPayments", to assist with this and ensure that you have a mechanism to validate your PCI compliance. SaferPayments has a low cost annual fee of £29.99. Please note if PCI compliance is not achieved within 3 months, a charge of £10 per month will be applied. All other information may be blacked out, and the statement must have been issued within the last 3 months. Please send this through as an electronic copy in response to the relevant email. Please note that a failure to submit a valid statement will incur delays in remittance of funds. Have a question? See out list of FAQ’s for useful information. Please note: Create Payments is powered by Worldpay and is currently available to UK and Ireland based businesses only.